Hello, and welcome to my website. I hope you find it interesting. You’ll find the latest posts below this introduction. My Second Novel – ‘No Safe Anchorage,’ – to be published October 2017. I’m very excited by this prospect. Like ‘Love and Music Will Endure’ it is set in the nineteenth century but in other respects it is very different. Robert Louis Stevenson makes a guest appearance but the main character, Lieutenant Tom Masters is a creation of my imagination. The action moves from the Highlands of Scotland to Canada. I shall write more about the story nearer publication but for now I shall quote the comments made by Donald S. Murray. He’s the acclaimed author of, ‘Herring Tales,’ ‘The Guga Stone’ and many other books of both prose and poetry. Since publishing my book I’ve done numerous readings across Scotland, from the Western Isles to Selkirk in the Borders and Wigtown in Dumfries and Galloway. This has been an enjoyable and stimulating process. More recently I’ve embarked on a different kind of talk,’Researching the life of Mairi Mhor – reconciling fact and fiction.’ I’ve spoken to full houses at the Gaelic Society of Inverness and for Portree Local History on Skye. The Gaelic Society of Inverness has a prestigious history. It was established by Charles Fraser MacKintosh, M.P. one of the leaders of the Land Reform movement. Mairi campaigned for him and helped him gain election as a Crofter M.P. The Society attracts eminent academics to speak at its meetings. So I found it quite a daunting experience. However I believe it’s important to publicise the thorough research done by historical novelists as some famous historians, David Starkey for example, has stated,’We really should stop taking historical novelists seriously as historians. The idea that they have authority is ludricious.’ That’s a view that should be challenged! ‘A most readable, entertaining and thought provoking historical novel’. Roger Hutchinson is a respected writer of numerous books on Highland topics. His best known work is probably ‘Calum’s Road’ about a crofter on the island of Raasay. After Inverness County Council refusing to construct a road from his village he built one himself. The book became the inspiration for a film about the struggle of African villagers construct their own road. ‘It is a terrific portrait of a woman who, as Aonghas MacNeacail writes, was big in every way.Big in size, yes. But big also in talent, in personality and above all in heart. Mairi Mhor deserved this book. Mary Macpherson of Skeabost in Skye, who is better known to this day as Mairi Mhor nan Oran, is one of the most celebrated and least understood Highlanders of the 19th century. She was also, which is extremely relevant, arguably the most gifted woman to come out of the Victorian Gaidhealtachd. In her later life she produced a stream of song and verse which became legendary, which gifted her the cognomen ‘nan oran’, and much of which, owing especially to the efforts of Donald Meek, is still accessible today. The trajectory of her life was not uncommon. She was born in 1821. Her MacDonald parents moved to Glasgow when she was about eight and back to Skye when she was a young woman. Mairi then moved for work to Inverness where she married a shoemaker called Isaac MacPherson. Isaac died in 1871 and Mairi became a nurse. She was briefly imprisoned for theft of minor items. That offence could have been an understandable mistake or a miscarriage of justice. Mairi always protested that she was innocent, and her time in jail seems to have cemented her radicalism. She then took up nursing in Greenock and became extremely active in Highland émigré social, sporting and political groups before returning finally to Skeabost in 1882 at the age of 61 years. She died in Portree in 1898. Thanks to Portree Local History Society there is now a plaque outside the town’s Rosedale Hotel which commemorates her last days in Beaumont Crescent. It seems like another age and of course it was. But as William Faulkner wrote – and Faulkner was not even thinking of the Highlands – ‘The past is never dead. It’s not even past’. If you’re looking for a good example of the man who shook the hand of the man who shook the hand of the woman who…..look no further. The late Colonel Jock MacDonald of Viewfield in Portree, who many of us remember, knew Mairi Mhor when he was a boy. Shortly before his own death in 1980, Colonel Jock passed on his memories of the grande dame to Aonghas ‘Dubh’ MacNeaacail, who is very much alive today and who subsequently published them. There are three Skye names to play with! There is a baton passed down through three centuries. The past is not even past. It is never more present than when interpreted in good historical fiction. All of which brings us to a great book which has been available for over a year but which has until now been inexcusably overlooked in this column. Historical fiction is a tricky genre at the best of times, which may partly be why Scotland is swamped by so much of the worst. It must satisfy two difficult criteria. It should read, obviously enough, as good fiction – it should have the approachability and stimulus, the narrative tension and gripping characterisation of a novel. Simultaneously, it should be faithful to fact, at least in its essentials. The two are not always compatible. In ‘Love and Music Will Endure’, Liz macRae Shaw squares the circle with charming ease. She has researched with the diligence of an historian. She has then used her imagination to slip loose the surly bonds of non-fiction to tell a wonderful story. 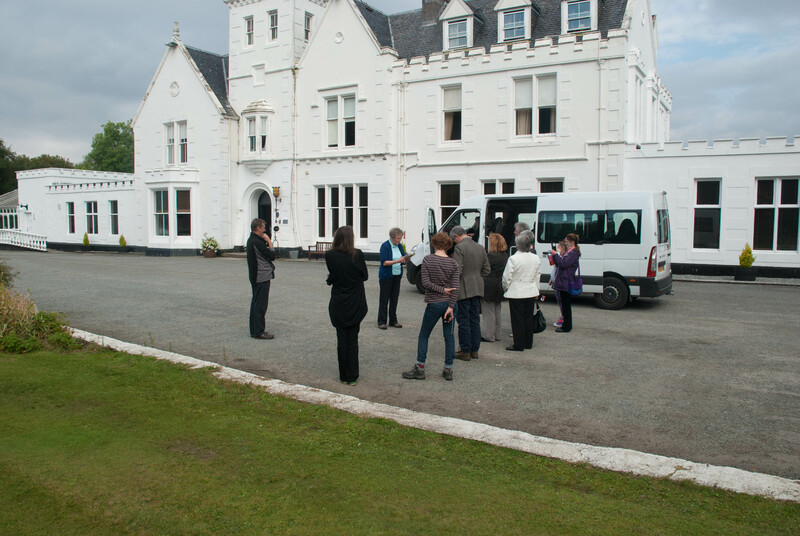 In many ways Mairi’s first 60 years were a rehearsal of her later life in Skye. Liz MacRae Shaw offers us a girl of her time; born and raised in pastoral hardship and beauty, lost and unhappy in the city stews, forced to ride the murderous waves of the agricultural and industrial revolutions, but thanks to the Gaelic ubiquity in 19th century Scotland, never deracinated. If she was personally radicalised by her experience of injustice in Inverness, her radicalisation was refined by the land politics of Clydeside in the 1870s. She returned to Skye in 1882. That was coincidental but could not have been more auspicious. It was the year of the Battle of the Braes, of militant discontent in Trotternish and Glendale. It was the year when everything kicked off and Skye became an international symbol of rural revolution. Many great names flocked to the island. Several of them were already familiar to Mairi Mhor and she soon got to know the others. This in turn gives Liz MacRae Shaw the opportunity, which she seizes with relish, to put flesh on the bones and words in the mouths of John Murdoch, Charles Fraser Macintosh, John Stuart Blackie, Edward MacHugh, Michael Davitt, Alexander MacKenzie of ‘The Celtic Magazine’, John MacPherson of Glendale and others. What bliss it would have been to be alive in Skye in those tumultuous few years in the 1880s, when anything seemed possible and a very great deal proved to have been achievable. These men stride into Shaw’s book and Mairi MacPherson’s life like mythological heroes. Their arrival is beautifully handled. By then Liz MacRae Shaw, and consequently her reader, is familiar enough with Mairi Mhor to realise how much of a Gaelic nationalist she is. Unlike Murdoch and Fraser Macintosh in particular, Mairi’s attachment to her fellow Gaels was more cultural than political. We are in no doubt that she would sooner, far sooner, have attended a shinty match or a ceilidh than a land league rally. 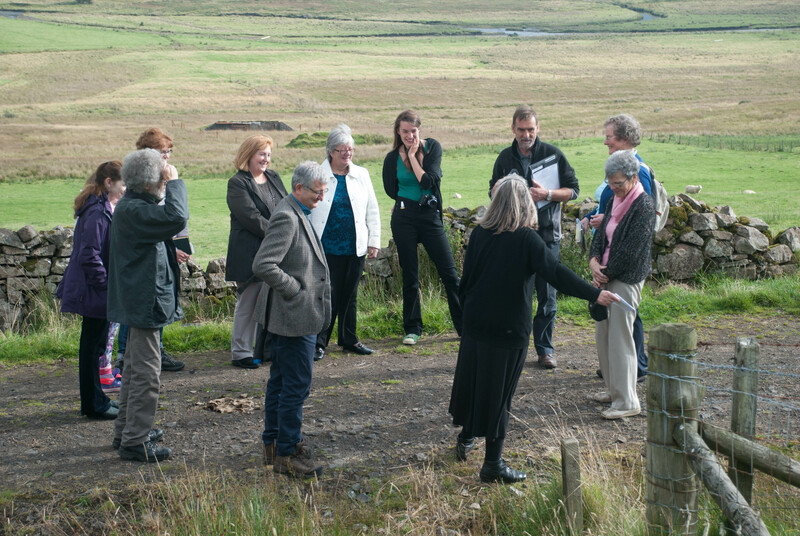 Liz MacRae Shaw offers us a person who is consequently torn between an attachment to the old clan structure and the new politics of land reform which were directly intended to disempower if not dispossess men like Lachlan Macdonald of Skeabost. Her sympathies were very far from uncommon among Highlanders of her own and later generations. It is a terrific portrait of a woman who, as Aonghas MacNeacail writes, was big in every way. Big in size, yes. But big also in talent, in personality and above all, in heart. Mairi Mhor deserved this book. ‘Home is the sailor, home from the sea’. When I looked at the poem again the line, ‘The wide and starry sky’ leapt from the page as it embodies the theme of a quest that is central to the story and also evokes the huge scale and wild nature of the Canadian landscape. There was one snag – when I checked on Amazon this title had already been used for two other books. The same applied to any other quotations from that poem. This is not surprising, given the fame of Robert Louis Stevenson. But I had become attached to my title. I left the problem for a few days, hoping that another idea would surface. I decided that ‘No Safe Anchorage’ conveyed a sensation of danger. Also of travelling in remote places, both real and metaphorical. 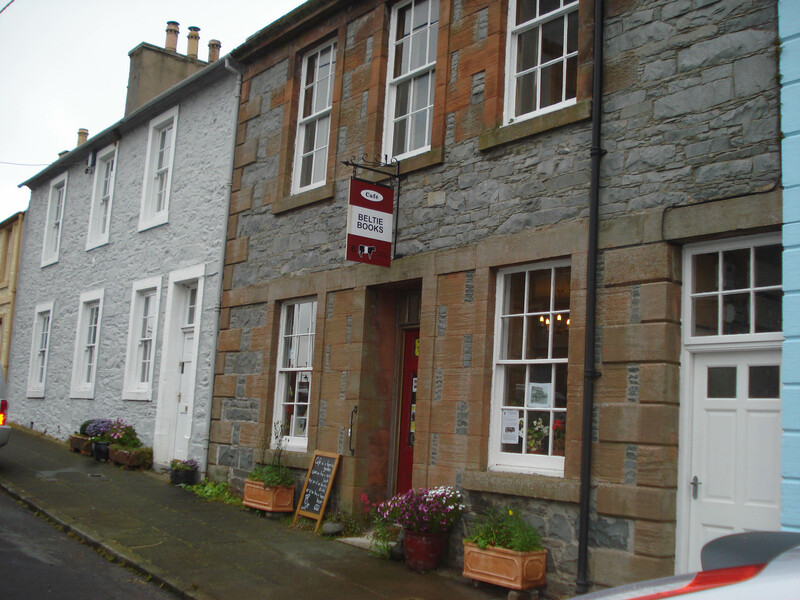 I recently visited Wigtown at the invitation of Andrew Wilson who owns Beltie Books and Café. The name refers to the famous Belted Galloway cattle. Wigtown is famous as a book town, a miniature Hay on Wye and hosts a well-known Book Festival every autumn. I was made very welcome and had a thoroughly enjoyable time, including an opportunity to see something of this beautiful, historic part of Scotland. My new book, ‘Light from the Window’ is undergoing its final editing and revision. It’s an historical novel, different from my first one in being much less closely based on the life of a real person. The setting is the Highlands of Scotland and Canada during the mid-nineteenth century. The seed of the story is a tragedy in 1822 near the island of Rona, a small rocky outcrop near the much larger Isle of Skye. Janet Mackenzie, one of my ancestors,, lived in a house on the shore and for many years she put an oil lamp in the window to help seafarers in the treacherous waters. In 1851 she came to the attention of Henry Otter, the captain of a naval survey vessel. 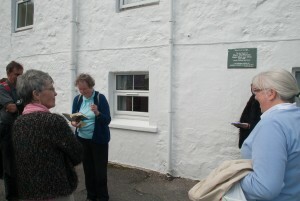 He wrote to The Northern Lighthouse Board about her dedication and recommended that she be given a pension. In 1857 the Stevenson brothers built a lighthouse on Rona, meaning that her light was no longer needed. Captain Otter continued with his surveying. Along with his useful charts of Hebridean waters there is another poignant reminder of his time in this part of the world. It’s a gravestone in memory of one of his sailors, Richard Williams, a coxswain who committed suicide and was buried near where once the Beal chapel stood on the Scorrybreac shore in Portree on the Isle of Skye. When I discovered these intriguing fragments of history, like pieces of coloured glass smoothed by the sea and lying gleaming among the rocks, I wondered about what had caused these events and what sort of backwash followed after them. Might Robert Louis Stevenson himself have spent time on Rona as a child? So I pieced these fragments together to begin the story of a quest with a mystery at its heart. Janet MacKenzie is the focus of the first part of the story. The focus then shifts to an imaginary sailor, Lieutenant Tom Masters whose adventures take him to Canada in pursuit of a mysterious woman who, he is convinced, holds the key to Richard’s death. I use the word ‘adventures’ because I felt the spirit of RLS pervades this story, even though he only appears briefly in it. My previous book dealt with the pain of eviction and forced emigration. This time I look at the other side of the picture, the opportunities that opened up for migrants to a new country. Tragically these migrants often treated the Native Americans with the same contempt which they had experienced in their own homeland. The lighthouse and the camera were both developed in the Victorian age. They serve as important metaphors in the novel. The lighthouse protects sailors but wreckers’ lights can mimic its beam and lure a ship to its destruction. The science of photography reveals but it also deceives. It hides as well as exposes so that a fleeting instant is recorded as if it were the whole truth. Love and Music Will Endure is an historical novel, published in 2013 by The Islands Book Trust @ £8.99. 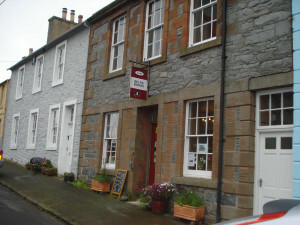 This is a well respected publisher of non fiction on cultural and historical aspects of the Highlands. My book is the first work of fiction they have produced. She was born to a crofting family in North Skye in 1821. Like many Gaels before and since she had to leave the island to find work. She moved to Inverness where she met and married a shoemaker with a Skye background, called Isaac MacPherson. They brought up a family of six, five of whom survived. Up to late middle age she had an unremarkable life but then two traumatic events occurred. The first one was Isaac’s death in 1871. Mairi had to earn a living and she worked as a private nurse in the house of an English soldier, Captain Turner. His young wife was seriously ill with a fever which caused her death. Mairi was accused of stealing her patient’s belongings while the family were attending her funeral. As a native Gaelic speaker Mairi didn’t understand the charges against her when she was tried in Inverness. The court found her guilty and she was given a short sentence. The shock of this experience unleashed her voice. She poured her rage and humiliation at the false accusation into an outpouring of songs that linked her personal distress with the despair of her fellow Highlanders being evicted from their homes. 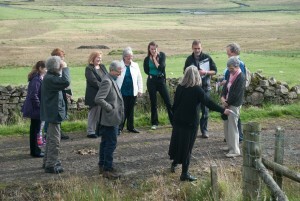 At this low point she was helped by John Murdoch, one of the leaders of the campaign for crofters’ rights. With his assistance she obtained a place at Glasgow Royal Infirmary where she trained as a nurse and midwife. At the same time she appeared at Land League meetings where she inspired the audiences with her singing. 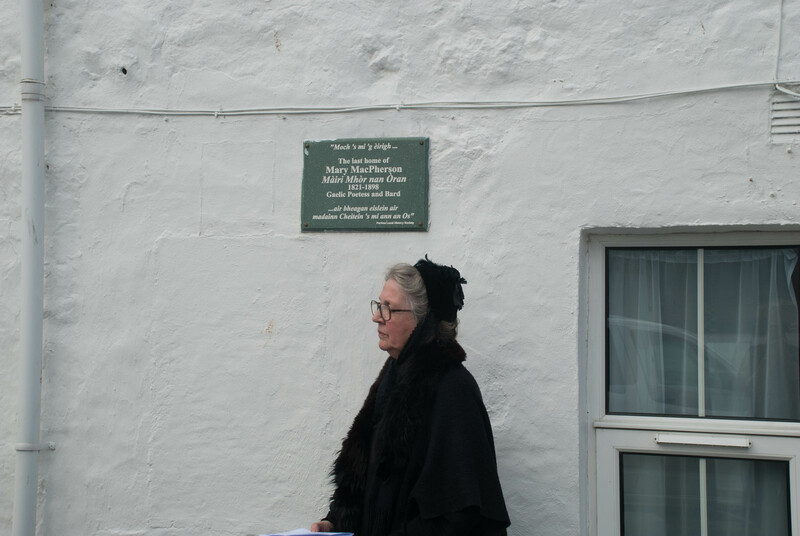 She visited Skye each year but longed to return permanently, especially as the island was becoming one of the main centres of opposition to unjust landlords. However, she couldn’t afford to give up work. In 1882 she had a stroke of luck, thanks to the generosity of Lachlan MacDonald who gave her a rent free house and later paid for her poetry to be published. He was a wealthy landowner but untypical off his class. Unusually he invited his tenants to set their own rents. Eventually the Napier Commission of 1886 gave crofters security of tenure but was only a partial success because it failed to address the problem of small, overcrowded crofts and the plight of those who had no land at all. It’s likely that Mairi experienced the disappointment of the returning exile. She died in 1898 in what is now the Rosedale Hotel in Portree. I have incorporated within my book the known facts about Mairi and the often amusing stories that have been passed down orally about her. For someone who died not so long before living memory there are many things we don’t know about her, especially her earlier life. So there has been scope to use my imagination to fill in the gaps. She was rooted in her homeland and her songs have survived because of her evocative words which were matched with beautiful tunes. Her story also has a universal resonance. She was one of that indomitable collection of Victorian women who refused to accept the constraints that society imposed on them. I chose the proverb because I felt it was a fitting comment on Mairi’s life. Aonghas MacNeacail, poet, songwriter and scriptwriter. 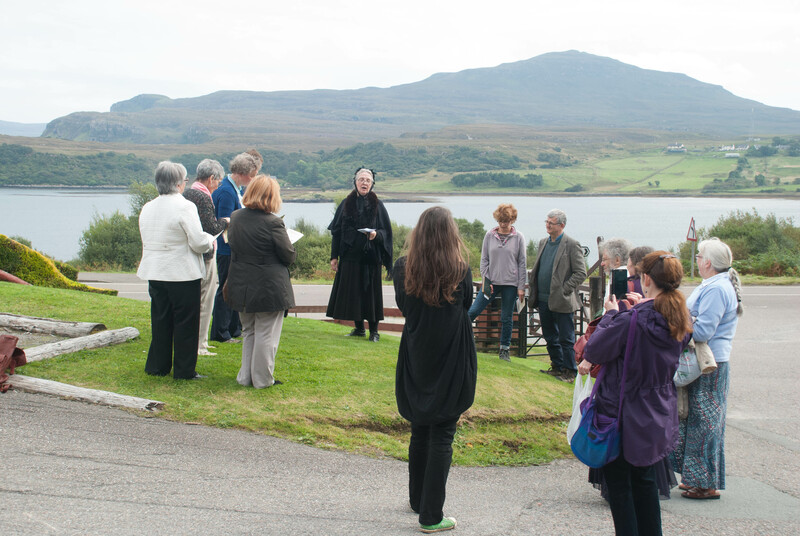 Images from the 2014 Skye Book Festival I did a minibus tour of the places associated with Mairi Mhor, with Morag Henrikson who sang some of her songs, beautifully and with John Phillips, the countryside ranger who filled in some of the historical background. As you can see we were very fortunate with the weather. Copies are available from bookshops and Amazon but if you prefer I can send you a copy directly ( £8.99 + £1.50 postage) if you e-mail me.